It’s with immense pleasure (and lots of caffeine) that I say “yes” to Bookbed’s suggestion that we resume this convo on common misunderstandings in literature. I feel like I’m constantly being bombarded by statements that echo this sentiment: at a cafe catch-up, a friend regales me with the numerous conveniences of living abroad (Amazon is so convenient without customs interfering! ), at a dinner a friend of a friend assures me that all of my efforts to produce fiction here—or from here, at least—will never be able to get anywhere because of the “system” and suggests I pack my bags to become a starving artist elsewhere. And yet, I always find myself somewhere that proves this wrong: at an independent bookshop browsing shelf after shelf of work by people who within a 20-km radius from me, at a book club meeting talking about the different ways in which plot has been utilized, at a book launch where there are more people than seats, at Fully Booked finding a book I hadn’t thought would make it to mainstream distribution. So while I will admit that things may be more difficult for us here in terms of funding or distribution, a big part of that struggle is also our reluctance to see change where it happens. Yes, there is a status quo to beat, yes, it is an uphill battle, but it’s one that we’re fighting. Without further ado, here are some of the most common misconceptions about what can and can’t happen here, in terms of publishing and readership. Short of saying: therefore, whatever you write will not be appreciated/consumed by enough people for it to make an impact. Somehow, we treat reading like it’s impractical despite the fact that it is a pre-requisite to pretty much everything – school, jobs, being able to know where you are. It’s thinking this that discourages people from both ends of an important exchange: people with the urge to write “seek more practical endeavors” and people with the urge to read are told to pursue hobbies with more “tangible” rewards. You can call me crazy but I am one to argue against the truth of Maslow’s hierarchy of needs. If that is true, then why is it that someone starving on the streets can be teeming with desire to write poetry whilst someone in a fancy office can have no idea what on earth he/she wants to do with a privileged life? We say “the common Filipino doesn’t read” but who is the common Filipino? Are we talking about those who fall below the poverty line? If so, then we do it despite knowing that a big percent of state scholars are people who can’t afford to go to private universities, and whose very survival depends on reading, and reading well. Maybe, then, we are talking about the upper-middle class? If so, then we do it despite knowing that a Fully Booked sale will always mean a crowd, we do it despite knowing that Komikon causes traffic jams. We do it despite knowing that it isn’t true. Let me venture a guess: When we say “the common Filipino,” it is almost a way of redirecting the responsibility for reading we feel we should be doing, or writing we feel we could be attempting. When we say “the common Filipino,” we almost always think we are talking about someone else. And so, in an attempt to make something kinda trite kinda new, I would say that if we want to change how things are done, then we have to stop assessing an external “landscape” or thinking about what the “madlang people” are doing. We need to take charge of our own actions, we need to be more aware of how we talk about the media we consume, and, of course, you know, we should read. Sure… and still events like Aklatan, Komikon and BLTX, all of which are low-key in their advertising and funded out of the pockets of literary/art enthusiasts, continue to occur on bigger scales every year. When people say “no one is going to go pay for something like that,” what they think they mean is they’re making a statement about “the landscape of local literature” or “the reading market” in general, but really, all they’re saying is they are assuming a product is not very good because they don’t think it’s worth paying for, or that they’re looking to sell people something they think is sub-par. So the solution again, is not to stop reading/writing because “no one is going to pay for that,” but to read and write more so that the repertoire of good work out there grows. Saying this comes from the deeper-rooted problem of fewer literary works being pushed out into the mainstream. We are seemingly presented with only two choices: 1) extremely academic work (read: anthology) written by the same people every anthology is written by, and 2) badly written fan fiction. However, as with most things, the only way to know if something is good or not is to read it and see for yourself. Also, there are many avenues to go to for reading materials that are neither purely academic nor badly written. There’s Uno Morato in Quezon City for diverse pickings of locally made books (from comics like Crime-Fighting Call Center Agents to books by the Youth & Beauty Brigade); there’s Visprint (available in most bookstores nationwide) for more mainstream selections like Trese, and Bob Ong’s work; there’s Flipreads (read our feature here!) for e-books. 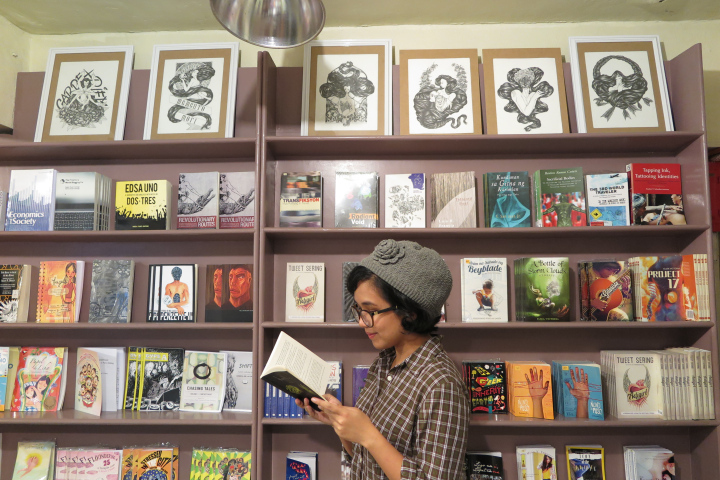 Alongside, there are literary journals like Plural Prose Journal (not just because I’m biased), Kritika Kultura, Poetry High Chair and TAYO Literary Magazine (while it’s headquartered in the US, lots of its contributors are locally based). There are two ways in which we can look at this comment: as creators and as consumers, of which we are usually both, just at different times. For the former: While having the ability to buy fancy advertising always helps make things easier, it has little to do with what it means to grow a healthy reading culture, especially these days when the internet is young, wild and free. Online, even things you would think cost a fortune to set up, like a custom domain, is not that expensive. For example, it’s $18-25 a year, amounting to P1,000 max annually. I can’t think of any utility off the top of my head that is that cheap. And so from the creator standpoint, there really isn’t much standing in your way if you want to go out and make something. Meanwhile, from a reader standpoint, all there is to do to consume a huge chunk of literature is to have the willpower to type the right search words into your URL bar. A great example of something like this is Adam David’s randomizer projects (The Nature of Beasts, machines of loving grace), which are well-crafted, accessible and utilize free web-hosting, or Mervin Malonzo’s Tabi Po which is incredibly written, amazingly drawn and is abso-freaking-lutely free. Then there’s the question of e-books, which are often for sale. The hesitation here is that one has to go and buy an e-reader like a Kindle or a Kobo. Incredibly enough, there are now free e-book reader programs and apps you can use on gadgets you already own. Writing Crossed Wires is something I’ve been feeling very buzzed about, and it’s because I think that writing online is a gigantic opportunity to contribute to not just literature itself, but the way that we talk about literature and the arts. The only time we can’t make a difference is when we discount ourselves, and decide not to participate.